While long-standing public news organizations are the main source for news for most Western Europeans, newer digital pathways to news are certainly gaining exposure. When asked their top social media site for news, respondents name Facebook the most often, by far. There is also evidence that publics have a tenuous relationship with the outlets they see on social media – as many as a third of adults in Western European countries say they don’t pay attention to the sources they get news from there. In the social media space, populist views and left-right political divides play only a limited role in people’s news behaviors. While those with populist views tend to express lower levels of trust in specific news outlets and give the news media lower marks for coverage of major issues, those divides don’t translate into social media news habits in all countries. 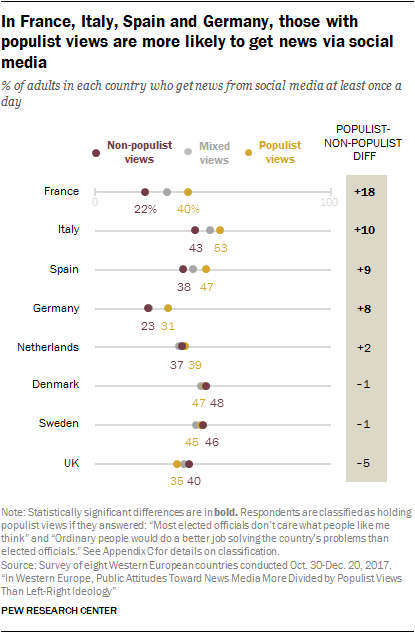 Those who hold populist views are more likely to get news from social media in France, Italy, Spain and Germany, but not in Denmark, the Netherlands, Sweden or the UK. In six of the eight countries surveyed, more than half say they ever get news from social media. And much of this news use occurs on a daily basis, especially in Italy, where half do so at least once a day. 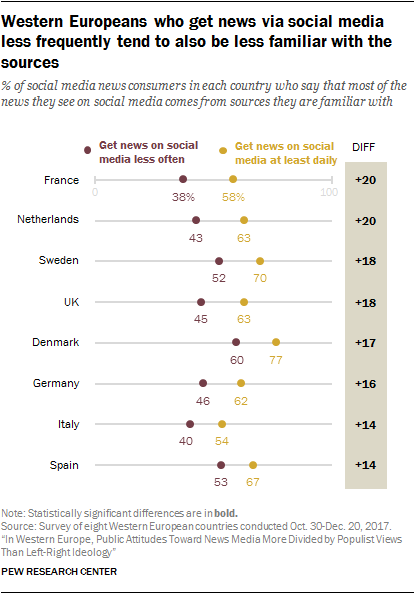 Getting news from social media is least common in France and Germany, where majorities (55% and 60%, respectively) say they do not get any news on social media. 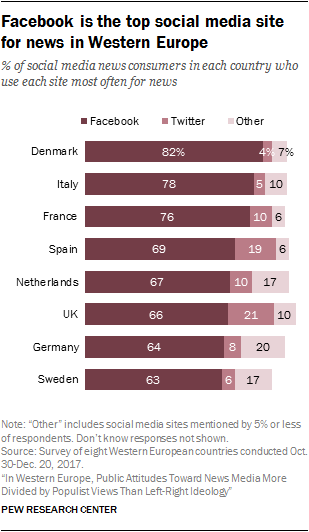 Facebook is followed distantly by Twitter, which is cited by between 4% and 21% of adults in these countries as the social media site they use most often for news. These findings are very similar to social media trends seen in the United States, where Facebook is the most common news source among social media sites (45% of U.S. adults get news there, with the next highest social media sites capturing 18% or less). One question often raised about the reliance on social media as a pathway to news is whether people notice the actual source of the news they find there. When asked whether or not most news they see on social media comes from news sources they are familiar with or if they do not pay attention to sources there, more than half of social media news consumers in each country say most sources they get news from on social media are ones they are familiar with. That ranges from a high of 72% of social media news consumers in Denmark, down to about half in France (53%) and Italy (51%). However, across the eight countries, between 16% and 35% of social media news consumers say they do not pay attention to the sources they see on social media at all. Roughly a third of adults say this in France, the Netherlands and Italy, while it is least common in Sweden (16%). 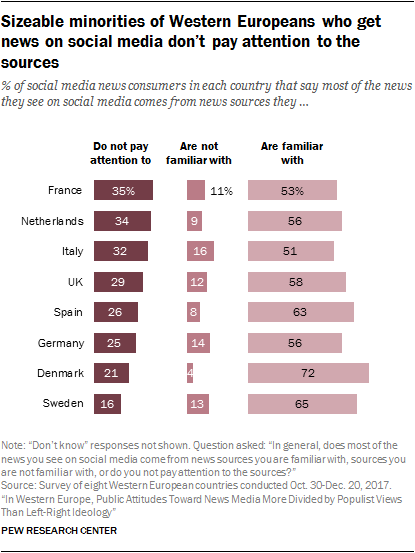 And indeed, more social media news consumers in most countries say they do not pay attention to sources than say the sources are mostly unfamiliar ones. 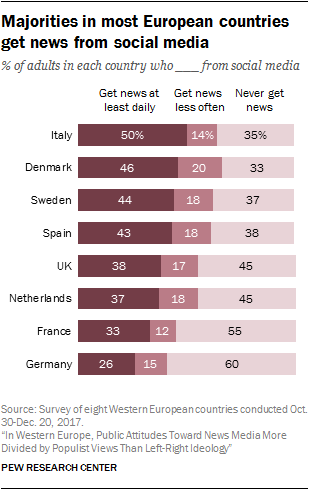 As little as 4% in Denmark to 16% in Italy say that most of the news they see on social media comes from unfamiliar news sources. Looking deeper into these responses, the frequency of social media use for news connects to the likelihood of recognizing familiar sources. Those who get news from social media on a daily basis are more likely than those who get news from these sites less often to be familiar with the sources they see there. This is true in all eight countries, with the largest differences in France and the Netherlands. For instance, 58% of daily social media news consumers in France say they are familiar with the sources they encounter on social media, compared with 38% of less frequent consumers. In both social media activity and personal discussions, most people are exposed to a variety of political views. Still, in most countries, personal discussions conform more to one’s own views than do discussions on social media. Across all eight nations surveyed, solid majorities of social media news consumers say the news they see on social media is rarely or only sometimes in line with their own political views. This ranges from 61% in Sweden to 83% in France. Conversely, no more than 26% in any country say the news they see on social media is often in line with their own political views. The “echo chamber” effect is more common when it comes to personal discussions about the news. 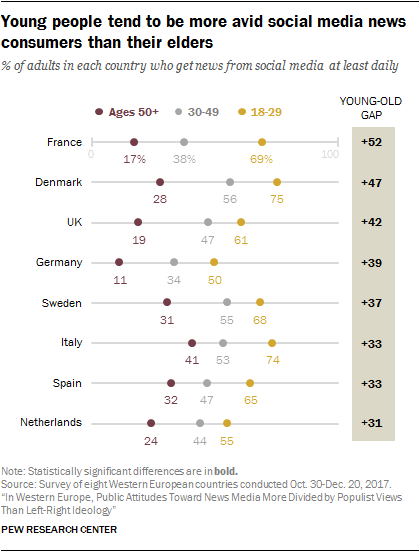 In a question posed to all adults in each country (rather than specifically to social media news consumers), about a quarter to a half of adults say the views they hear in personal discussions are often in line with their own. The highest share occurs in Sweden (51%), which also has the second-highest portion of social media consumers who say they mostly see their own views in the news they get on social media (22%). In seven of the eight countries surveyed, these findings on how often people encounter news or discussions that challenge their own political views – whether on social media or in face-to-face conversations – holds true regardless of ideological leanings. That is, in most countries, both left-aligned and right-aligned social media news consumers are about equally likely to say the news they see on social media is often in line with their own views. Among all adults, the same is true for the political views they encounter during personal discussions. The UK is an exception: Social media news consumers on the left are more likely to say that the news they encounter is often in line with their own views than social media news consumers on the right (29% vs. 9%). And among all adults in the UK, those on the left are more likely to have personal discussions with people who hold political views similar to their own (31% vs. 23%). (France shows a slight political difference in who gets news in line with their views on social media, but to a much lesser degree: 16% on the left get news in line with their views on social media, vs. 8% on the right). 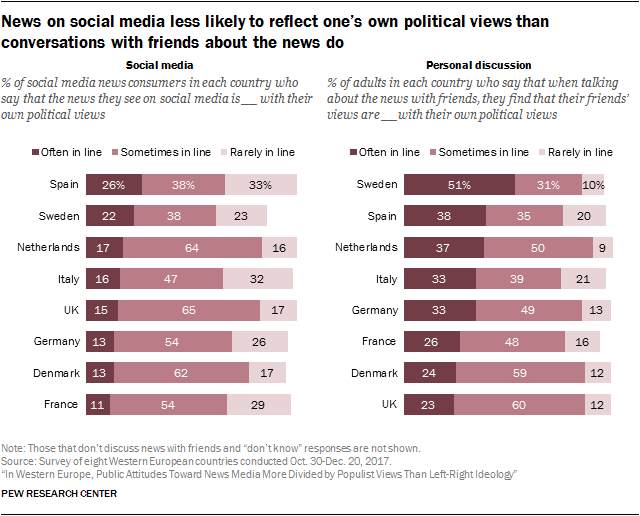 The reality of any “echo chamber” effect on social media does not necessarily reflect the desires of social media news consumers in these countries. Spain, for example, registered the highest percentage of social media consumers who see news that is often in line with their views (26%). 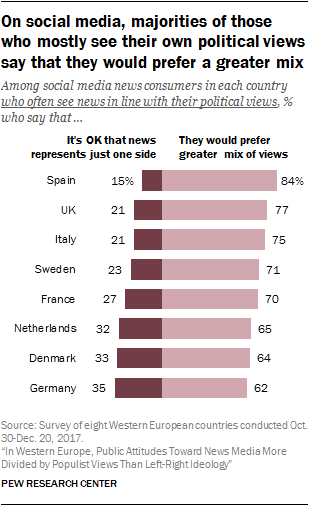 But among those news consumers, Spain also has the highest share who says that they prefer a greater mix of views in their social media content (84%). 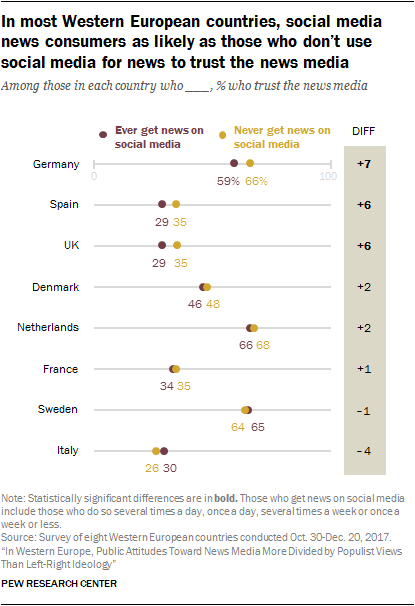 In Germany, Spain and the UK, social media news consumers are less likely to trust the news media than those who don’t use social media for news. Even in these countries, the difference in media trust between social media news consumers and non-consumers is small – no larger than 7 points. In the rest of the countries surveyed, there are no differences between the two groups. In four of the eight countries surveyed, populists are more likely to use social media for news than those without populist views. The difference is greatest in France where the gap between populists and non-populists reaches 18 percentage points. In most countries, populist leanings do not relate to whether people are exposed to news on social media in line with their own political views or whether they pay attention to news sources on social media. In two countries though, the Netherlands and the UK, these populist views play a role. In both countries populists are about half as likely as non-populists to say that they find views on social media that are often in line with their own (12% in the Netherlands, compared with 22% and 10% vs. 21% in the UK). In addition, populists are also more likely to say they don’t pay attention to sources on social media in these countries. In the Netherlands, 39% of those with populist views say they don’t pay attention to sources on social media, compared with 28% of those without populist views. For the UK, the respective numbers are 33% vs. 21%.